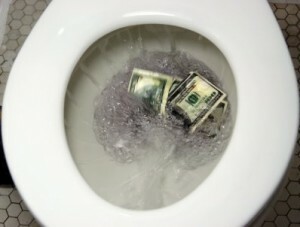 5 Ways People Waste MoneyEliminate The Muda! Ignorance – Lack of knowledge has probably been the greatest cause of wasted money in my life. I would start with my first 30 years of existence and roll them all up into one giant ball of financial failure! While many lay blame on their parents or schools for their lack of finance related skills I think this is a cop-out. As a parent I do believe we have a responsibility to provide our children with guidance and education on all things related to money. Frugality to financing should be a part of every child’s upbringing. Schools too should see the societal benefits of educating our children to be financially competent. But when our parents fail or our schools fail we have a responsibility to ourselves, our families and our country to take the necessary steps to learn what we must. This article was featured in the Festival of Frugality hosted by Canadian Finance Blog. Take a look for more great articles on personal finance. Stupidity – Even after you learned to ride a bike there were times that you experience momentary lapses of intelligence. You knew you should have been looking in front instead of that cute girl passing by in a car, but you slammed into the wall anyway! Complete with an education and understanding of personal finance we may still make stupid mistakes. We may fall for a poor investment following the herd into technology or oil. We may misjudge the risks and rewards of a whole-life policy over a term life policy. With every financial decision, be it an minor expense or major investment we should take time to be prudent. Avoid hasty decisions and make the effort to gather as much information as reasonably possible before moving forward. Laziness – Not taking action may be as or more detrimental than taking the wrong action. Laziness when it comes to building wealth seems largely to fall upon us when we are younger. We have difficulty thinking long-term and envisioning a future where our only support may come from what we have saved ourselves. Lucrative opportunities may fall into our laps that we let slide because we are already worn from a full work week. 1) Do nothing and pay for it big-time in the future. 2) Do it too late and be forced to work extra hard for smaller benefit. 3) Spend a lifetime of reasonable effort for what should be substantial return. Impatience – The best explanation for this would be how we pay a convenience tax provided by fellow Yakezie member Engineer Your Finances. The very first time my wife and I began tracking our expenses we found we were spending over $800 per month on dining out! We paid huge profits to restaurants for the convenience of not having to cook, clean dishes or wait a little be longer while preparing our meals. People pay vendors to replace a light switch or repair their leaky faucet because they are too impatient to take the time to learn how to do it themselves. We are impatient often because of our perceptions that we lack time. We don’t lack time; there is no less time today than there was yesterday. We are simply not using the time we have effectively. Consider what you do each day; everything. Then consider what it truly necessary to accomplish your goals and maintain a fulfilling life. Materialism – At least as far back as the late 1700’s Adam Smith recognized the civilized man’s desire to accumulate at the rate with which his income increased. With the added advantage of debt and our ability to leverage what capital we have, our desire to consume and accumulate has only increased. No sooner than we buy a new flat screen TV do we see a bigger and crisper picture on another. No sooner than we drive home in a new car might we begin dreaming of a faster or larger one for the next purchase. And if not large and expensive purchases many of us must have the name brand from the right store for fear that our friends will think differently of us. Breaking down the concepts of what is needed as being unique and separate of what is wanted will provide significant opportunities to save. I’m sure that you are not guilty of any of these mistakes ;-), but your neighbors on the left and on the right probably are. Certainly I have made each and every mistake. Readers: Reflecting on your financial or spending decisions can you share how you overcame one of these habits of waste? Certainly this is not a definitive list, can you provide another common example of how people waste money? I think the materialism bit was important here as it’s probably the biggest waste of cash ever! Mind you I have lost a lot of cash from stupidity in the past!! First off, great post…I can’t say enough about you hitting the BIG ONES here. One way we learned to deal with impatience is we saved up and paid cash for our vacations. No plastic vacations are great…they don’t follow you home :-). How to overcome money pitfalls? We stopped thinking we were ‘entitled’ to stuff just because we work hard. We also started tracking each and every dollar we spent so that at the end of the month, we could see that we’d paid $100 for lattes–which allowed us to decide we didn’t want to spend $1200 a year that way! @ Forest – Great story! Thank you for sharing that even if you don’t recall. Your comment about materialism makes me wonder though if we could calculate the total of everyone’s waste where would we find the most? @ Ken – Good call, impatience has certainly been one of my major mistakes. No longer, my hard earned money is more important than my impatience now. @ Simple in France – It is scary when you first track your expenses, isn’t it? I remember when we totaled up our dining expense that first month. I had to run the numbers over and over because I didn’t believe them. @ Money Reasons – No doubt we have all experienced them. I kind of look at it like the 12 steps of AA, the first step is admitting you have a problem. But I’m not sure I will ever overcome the stupidity! I think the photo with this post says it all (and it totally makes me cringe). .-= RainyDaySaver´s last blog ..New Blog Look =-. Greg-san, the way I’ve overcome some materialism is by simply having NO disposable income! Can’t drown if you have no water! My funds are locked away as soon as it hits my bank account. Great post. Our church just finished up a series of sermons on gaining margin. It is so hard to come down a level of lifestyle once a superior level is already achieved. My wife and I debated for a whole year whether we should downsize our house and use the savings to gain margin. I finally won :). Once we sell our house we will be able to give more to the needs of the less fortunate. Great post. I’m interested in your plight. I’m going to subscribe to your posts because you have a different perspective on gaining wealth. .-= @conqueringPF´s last blog ..Step 1: Define Passion =-. Hey – great post. Awesome picture. Another way a lot of people waste money is having an external scoreboard and always looking to their neighbor as a benchmark. Keeping up with the Jones’ is a waste of money because the Jones’ are trying to keep up with you! .-= Mike´s last blog ..Automation: Why You Don’t Have to Feel Bad About Spending Ever Again =-. Materialism can be a lifetime struggle. I see friends and people that just ‘have to’ have all the new gadgets and the best of everything that money can buy. It’s the ‘live for today’ philosophy and it can easily come back and bite hard down the road. I’ve recently begun identifying the “muda” in my daily work routine. Micro-coordinating efforts can be tough. John Perkins quoted in his recent book, Hoodwinked, that if India & China modeled after the US – we would need something like 5 planets to sustain that consumption. @ RainyDay – How do you think I felt seeing my money go down the toilet? @ Samuari – Maybe you should go by Confucius. Paying yourself first is the best method. You cannot spend what you don’t have. @ ConqueringPF – I am glad to have you as a subscriber! and thanks for the comments. I’ve been working on my wife too, trying to get her use to the idea that our next house will be smaller and cheaper. One step at a time! @ Mike – The jones’… to me materialism. Why you do it doesn’t matter but the fact that you do absolutely does matter! Thanks for stopping in Mike! @ Ryan – I’ve been OTB myself more than once. Sorry to hear but hope you are OK! Thanks you for the compliment. Coming from a writer such as yourself, that is a real thrill! @ Rat – No doubt! Giving up gadgets is tough though. Almost as tough as smoking was! @ FinEngr – My pleasure, the convenience tax was a great post! Muda elimination is not suppose to be tough. Don’t try to do it all at once, do it one at a time. @TheLeanLifeCoach: Smoking was by far the hardest thing I have EVER done…two years quit this past January. It was harder to quit than doing my university degree or any job I ever had (yes, even the call-centre job I had). It took me 7 times trying, but once I got it kicked, there was no turning back. Saved a boatload of ca$h from quitting too, which is always good.